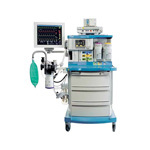 The Drager Fabius GS is an inhalation anesthesia machine used in an operating, induction, and recovery rooms. It can be used with O2, N2O, and AIR supplied by a medical gas pipeline system or have externally mounted gas cylinders. The Fabius GS is equipped with a compact breathing system that provides fresh gas decoupling, PEEP, and pressure limitation. This anesthesia machine has 5 main ventilation options that include; Volume Controlled Ventilation, Pressure Controlled Ventilation, Pressure Support, Manual Ventilation, and Spontaneous Breathing. It's equipped with an electrically driven and electronically controlled ventilator that monitors for airway pressure (P), volume (V), and inspiratory oxygen concentration (FiO2). 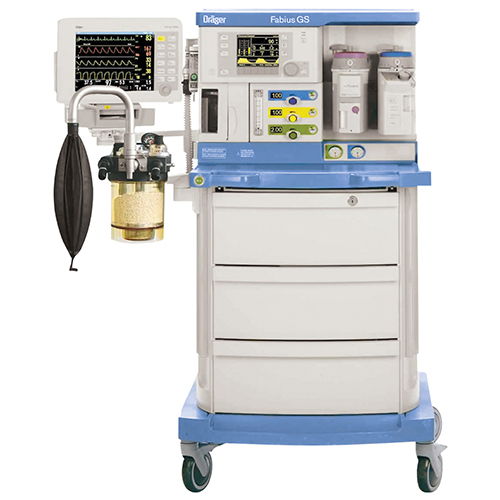 The Drager Fabius GS anesthesia machine is a popular choice for practitioners who demand advanced ventilation technology combined with reliable and proven breathing system components. The Fabius GS anesthesia workstation opens new frontiers in ventilation performance while maintaining well-established functionality. Continuous monitoring during transport and automatic reconfiguration of site-specific parameters with Dräger’s innovative Infinity Docking Stations (IDS). 100 - 240 VAC, 50/60 Hz, 2.3 A max. Freq Min Apnea Ventialtion minimum frequency: 2 - 20 bpm (1 bpm resolution) and "OFF"
The Drager Vapor quick-change plug-in system for up to two anesthetic agent vaporizers. The connections are automatically closed and sealed when the vaporizer is removed. The electronically driven and electronically controlled Fabius GS E-vent ventilator requires no drive gas. This makes it more flexible and economical to use than traditional gas-driven bellows ventilators by limiting the consumption of expensive medical grade gas to patient use only. Using Motor-driven hardware and software-controlled functionality offer virtually unlimited upgradeability. The GS is suitable for any patient, pediatric to adult, and provides Volume Controlled Ventilation, Pressure Controlled Ventilation, and Synchronized Volume Control, Pressure Support and manual Spontaneous modes. Pressure Support mode facilities spontaneous breathing by removing the work of breathing due to circuit resistance, improving comfort levels and enhancing the quality of patient care. This anesthesia machine is the world's first anesthesia machine with vertical flow controls and electronic fresh gas flow indicators. This enables you to compare gas flows more easily and intuitively. Additionally, the export of fresh gas data to an information system allows monitoring of gas usage and to promote the use of low-flow anesthesia. The flexible, ergonomic design of the Drager Fabius GS allows for optimal positioning of the semi-closed breathing system (COSY), The COSY can be height-adjusted, pre-assembled on the left or right side of the machine, and can be easily removed for cleaning and sterilization. The COSY not only minimizes set-up and installation time but also substantially reduces the potential for leaks, OR pollution and overall gas consumption. The Infinity monitoring line offers an outstanding cable management approach. The MultiMed parameter module reduces cable clutter and simplifies patient transfer. Moreover, the unique Pick and GO capabilities of the Infinity patient monitoring system provide continuous monitoring during transport and automatic reconfiguration of site-specific parameters with Drager Medical's innovative Infinity Docking Stations. The Pick and Go concept also provides significant efficiency and quality benefits. Because the monitor moves with the patient, no separate transport monitor is required and you will need fewer monitors throughout the patient care process. The choice of a fixed-mount monitoring solution or the Pick and Go transport concept gives you maximum flexibility to adapt your complete anesthesia solution to today's evolving requirements. Our latest monitoring solutions allow you to choose the high-efficiency data-access tools that make the most sense for your viewing needs. The new Infinity Omega solution uses a two-screen system approach so you can see patient monitoring data and clinical data simultaneously. It includes a Delta patient monitor with the Infinity Docking Station and a 17" touch screen smart display all to help eliminate information access bottlenecks, keep you confidently on top of your entire environment and offer maximum flexibility for your long-term IT needs. With an optional web browser, you can access web-based applications as well. Sensitive Oxygen Ratio Controller (S-ORC) guarantees a minimum O2 concentration of 23% in an O2/N2O mixture. N2O cut-off if the O2 fresh gas valve is closed or if the O2 flow is less than 0.2 L/min. Audible and visual (flashing red LED) indication in case O2 pressure drops below 20 psi (1.38 bar) ± 4 psi (0.27 bar). 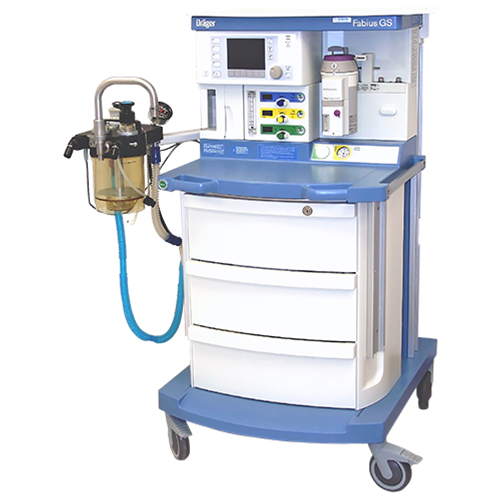 Soma Technology, Inc. offers Refurbished Drager Fabius anesthesia machines up to 50% below OEM prices with the same service and warranty as new. The Fabius GS anesthesia machine is not only technically refurbished but also cosmetically refurbished to make it work and look like new. When the refurbishing process starts on the Drager Fabius GS, the anesthesia system is carefully inspected and tested by our own in-house biomedical engineers that are highly skilled and certified to work on Drager Fabius GS anesthesia machines. If necessary, parts are replaced to make sure that all aspects of the system are functioning properly. Once everything is in working order, the unit is calibrated back to the original engineering manufacturer specifications. This ensures that the unit is working the same way that it originally left the manufacturer. After the Fabius GS is working like new it undergoes a special cosmetic restoration process. The Drager Fabius GS is cleaned, minor scratches and dents are repaired, it's painted, and new decals are replaced if necessary. After this strenuous refurbishing process, the anesthesia machine functions and looks like new. Soma Technology is ISO 13485 certified and ensures that the best quality is given to all capital medical equipment that they sell. Before the unit is labeled patient-ready and packed up for shipment, it goes through one last quality control test that makes sure all aspects are again working like they should. If you are looking to buy refurbished Drager Fabius GS anesthesia machine contact soma at [email protected] or call us at 1-800-GET-SOMA. 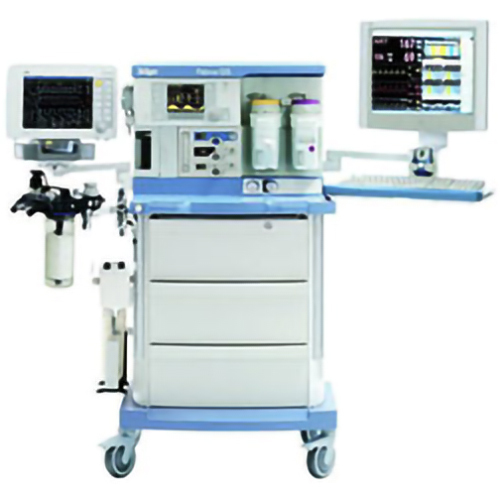 Soma Technology, Inc. is also actively looking to purchase Drager Fabius GS anesthesia machines. If you or your facility is looking to sell your Drager Fabius GS, be sure to contact Soma Technology, Inc. Soma has a dedicated and experienced purchasing department that helps you through the entire process. Selling your used or pre-owned Fabius GS to Soma Technology takes out the middle man in the equation. This also ensures that your medical facility gets top dollar for your equipment. Soma Technology is 100% HIPPA compliant and makes sure that your equipment gets to our facility in the same condition that it left yours. Soma Technology also gives the option for trade-in credit on your medical equipment. If you or your facility is looking to regain floor space for new equipment, or looking to upgrade current equipment, contact Soma Technology’s purchasing department at [email protected] or send us a message on our Sell to Soma website.